The fountain was designed as a memorial to Diana Princess of Wales and opened in 2004. It is a loop of finely sculptured granite. Water enters at the highest point and flows in two directions, meeting at the lowest point. It is then recycled. The arrangement is capable of many symbolic interpretations: the circle of life; two people joining, parting and coming together again as they leave the world; the meaninglessness of endeavour; a moebius strip; life and death. Kathryn Gustafson designed the fountain and conceived it as a place of tranquility. This was rendered difficult by the large numbers of people wishing to visit a memorial to the beloved princess. 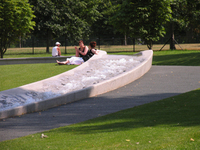 In the opening year (2004) the grass beside the water channel was worn out and there was al problem with children slipping on the wet granite. These problems were solved by cutting ribs in the granite, installing more hard surfacing and putting security guards on duty to keep people from walking in the channel.. From the lakeside walk, the memorial fountain looks like a low concrete retaining wall protruding above the grass. When standing beside the water channel it can be seen for what it is: an extremely high quality piece of water sculpture. See comment on Kathryn Gustafson's landscape architecture.